Description: If you pay attention to the media, it would be hard to miss all of the articles, books and reports declaring the decline of the Christian church in America. From falling attendance numbers, shrinking membership roles to declining conversions, it seems like there is no good news for the American Church. But are we really in a crisis or is this simply just a correction? Could it be that over the last 30 years the church has lost sight of its mission and purpose and what we are experiencing is simply God's way of calling it back to Him? We begin a new series based on Romans 12 that suggest the answers might be found in the Apostle Paul's call for believers to become "Living Sacrifices". Join us as we discover what that really means and how it has effected not only the churches in America, but individual believers and their ability to see the power and purposes of God for their lives. In the introduction to this series we examine Romans 12:1 and ask the question, are their "Too Many Empty Altars"? If you pay attention to the media, it would be hard to miss all of the articles, books and reports declaring the decline of the Christian church in America. From falling attendance numbers, shrinking membership roles to declining conversions, it seems like there is no good news for the American Church. But are we really in a crisis or is this simply just a correction? Could it be that over the last 30 years the church has lost sight of its mission and purpose and what we are experiencing is simply God's way of calling it back to Him? We begin a new series based on Romans 12 that suggest the answers might be found in the Apostle Paul's call for believers to become "Living Sacrifices". Join us as we discover what that really means and how it has effected not only the churches in America, but individual believers and their ability to see the power and purposes of God for their lives. 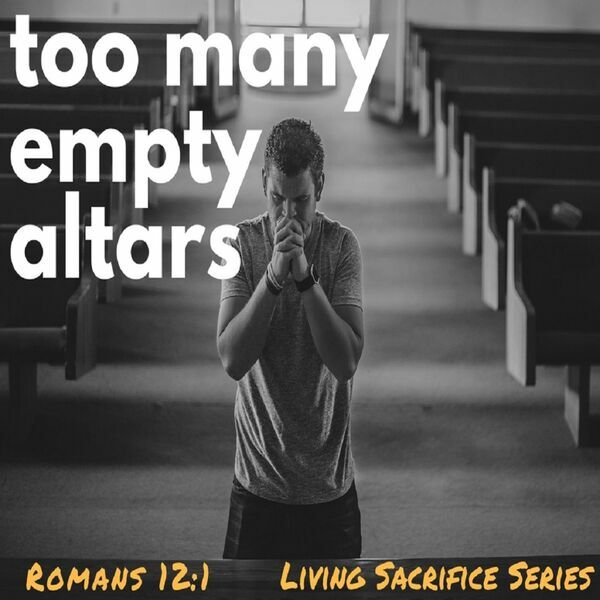 In the introduction to this series we examine Romans 12:1 and ask the question, are their "Too Many Empty Altars"?